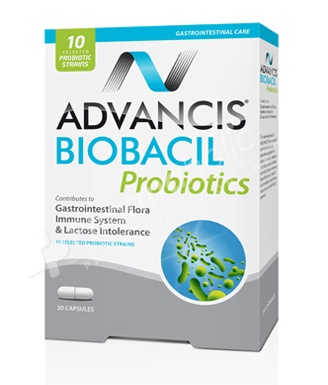 Advancis Biobacil Probiotics is a probiotic complex, composed of 10 selected strains that improve the intestinal flora. Regulate the intestinal transit help to surpass diarrhea.Support the immune system. Children from 3 to 6 years: Same dosage as above. Open the capsule and dissolve its content in water or juice. Complex of selected strains: (Lactobacillus acidophilus, Lactobacillus casei, Lactobacillus plantarum, Lactobacillus salivarius, Bifidobacterium longum, Bifidobacterium animalis subsp. lactis, Bifidobacterium infantis, Lactococcus lactis subsp. lactis, Enterococcus faecium, Saccharomyces cerevisiae - 1010 UFC/g) 50%; Gelling agent: Microcrystalline cellulose; Anti-caking: Tricalcium phosphate, Corn maltodextrin; Magnesium stearate, Talc; Vitamin B6(Pyridoxine hydrochloride) 0,28%; Vitamin B2(Riboflavine) 0,28%; Vitamin B1(Thiamine hydrochloride) 0,22%; Gelatin.